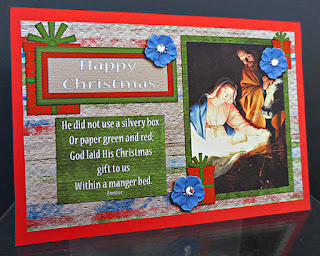 This month I am again taking part in a Blog Train with my digital designing and the theme for the kits we are all giving away is " Joy to the World" so I decided to use those words for this challenge. If you want to create something ( digital or paper crafts ) and join me just choose one or all of the words. I chose to use the word "World" and therefore use the scripture John 3:16 on my little CD case sized artwork. The digital pieces I have used for my page are all from the kit I designed and you are most welcome to pop over to my digital blog which you will see listed on the right side of this blog and download what I designed and then hop on board the Blog Train and see what the other designers have created and are giving away. I do not have many thoughts to share this month as I am having a busy time. Last week I had my 2 oldest granddaughters come to stay while their parents and baby sister were in another state so their Dad could have an operation on his big toe. The week before the girls came I had a night in hospital with suspected heart attack. I am fine... turned out to be severe acid reflux which can have similar symptoms to a heart attack. I needed to be checked out as my father had a bad heart and eventually had a triple by-pass. My maternal grandmother died at 55 ( the age I am next year ) with a bad heart. All the hours I spent in the hospital I can truly say that my Heavenly Father gave me peace and at home my dear husband also experienced a deep inner peace. My last surviving Uncle died last Wednesday ( 12-12-12 ) so I have a funeral to attend tomorrow where I will be doing one of the bible readings and I know I am going to need the Lord's strength to get me through it as the reading is Psalm 23 which was also used at my Dad's funeral 7 years ago. My Aunt needed my help in typing up the eulogy which I have done. 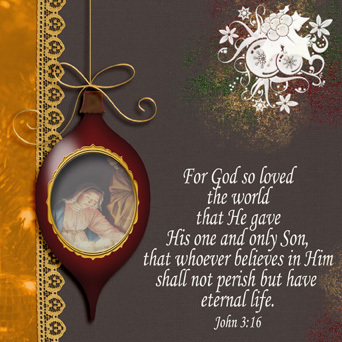 The goodness and love of God became incarnate at Bethlehem. I liked that poem so much that I used it on a hybrid card I made which I will now share and then I will share the page I created using the kit I designed. I hope those reading this blog will have a very Happy Christmas with safe travels and special times with loved ones. So sorry you've had such a rough week or so. I'll be praying as you go to the funeral. Sad times. Your cards are beautiful. I adore your choice of word and the LO you made to go with it. Just lovely. Really touched my heart. May His peace surround and His comfort flood your soul. Oh, Anne Marie! I'm so sorry for all that's going on in you life right now! I'm so happy to hear you are fine! God is a wonderful gifter of that peace that we need in such times, isn't He? I pray for you always, and it's good to know how those prayers should be directed! Thank you for sharing!